This project was set up in 2002, under the auspices of the EC, with the strategic goal to pave the way for a unified system of telemedicine - often referred to as eHealth - across Europe. Its first job was to survey the market and create a vision for eHealth in Europe and map the best way forward. The team performed this survey, not only reviewing available documentation, but carrying out personal interviews with more than 50 key experts across the various domains of eHealth. This survey identified many roadblocks and hindrances along this difficult road, the most critical of which is interoperability between the various systems, locally, regionally, nationally, and trans-nationally. The team observed that although there was much work being carried out in the field of interoperability, a holistic approach, across the different frameworks, be they technical, organisational, social, or policy, was missing. Moreover, the team observed that visions of eHealth are often put forward by various interest groups; in this potentially lucrative world of eHealth, this results in biases serving the interests of that group rather than the citizen. More often than not, only lip service is paid to the central subject – the Citizen. The TM Alliance decided early on to put the citizen in the centre of its vision, and formulated a Vision of Citizen-Centred healthcare. This vision, although seemingly self-evident in theory, turns out to be very difficult in practise. In most systems, the citizen is not the customer and subject of care, but rather is the object of care, while the customer, supposedly representing his/her interests are some large public, or semi-public organisations, operating very remotely from this utopian vision. How often have you been asked about previous diagnoses, disease, or test results, and you had to through your hands up in despair in response? Although you may access your bank account anytime from any place, you certainly cannot do so with your precious health data: In fact, few patients have ever set eyes on their data! Surely if the citizen is in control he should at least have access to his own vital information and have the right to pass it on as he sees fit without major effort and time delays that render such effort useless! Indeed, what was not possible a few years ago is now easy: The Internet has become a medium for access of information of all sorts as well as means to do our everyday business. Not yet so for our healthcare. But it can be; the tools are available. If we draw the picture properly of how we want things to be and write the specifications for the new world of eHealth to be a citizen-centred world, then we may have the chance of coming closer to realizing the vision where we, the citizen and patient are centre of the system, as it should be. Notwithstanding the broad transformation of the way our world operates enabled by the introduction of the media and methods ICT, there is in fact a reluctance to accept these changes in the established world of healthcare. In the technically advanced countries of Europe, despite having the tools and know-how, this transformation has proved to be particularly difficult. One of the major problems preventing the expansion of telemedicine is the question of data security and privacy. eHealth depends on the exchange of data and a ‘virtual’ electronic health record. It is therefore particularly important that ways are found to ensure that communications of vital private information can be effected securely. Reliable and easy-to-use mechanisms for authentication, privacy and integrity have to be set up to allow secure data exchange between the different actors. Data protection is a prerequisite for building confidence in the modern IT-based data-transfer systems that will be used to transmit medical, personal and confidential data. The many cultural differences between European countries makes Europe a unique and fascinating continent. There are regional and national differences in language, education systems, professional qualifications, re-imbursement, health-care systems, and methods of treatment. Any plan for a European-wide eHealth system must take these differences into account and allow for smooth connectivity between the various systems. Careful examination of methodologies, cost effectiveness, legal differences, and national health policies, must accompany the improvement and rationalisation of technology so that all the systems can talk with each other effectively and smoothly. The technology needed by the health sector can be categorised as digital imaging, the evolution from 2D low resolution paper-supported slow images to 3D digital collaborative image systems; transmission, including network telecommunication capabilities and standards; and data acquisition and processing to cover the identification, selection and sampling of data for further computer processing. The telecommunications technology already available is sufficient for most eHealth needs and current standards already allow interoperability. The main challenge is the integration of eHealth technology into existing health systems. Especially relevant for the medical area are ongoing efforts to digitalise and standardise all types of health records. The synergy of these technologies will increase the quantity and precision of information on a patient, and ensure that this data can be made available to the right decision maker at the right time and in the right place. 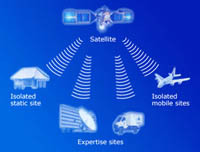 Future developments will see an increased use of satellites, particularly in situations such as natural disasters and emergencies, and where the existing infrastructure is poor or non-existent. One of the specific qualities of satellites - the ability to oversee and monitor large parts of the continent - is also likely to come more into play in a future unified European system of eHealth. TMA-Bridge is a second phase of the work of the TM Alliance towards bridging the vast gulf between our Vision and its realization. This short bridging phase comprises the same consortium as TM Alliance, and has taken on itself the difficult goal of facilitating the lowering of barriers of interoperability between the different systems and the different domains of healthcare.